Well, it has been an interesting couple of days weather-wise, but as the cold snap continues, we look out of our widows on the top floor of Arrow Mill and are reminded just how beautiful our surrounding area is. 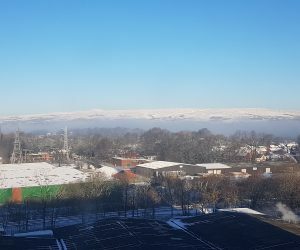 With views across to Scout Moor wind farm and the Pennines beyond, the combination of the sun, bright blue sky and just a hint of the lingering mist over the snow-capped hills, it all makes for a stunning vista. All of our serviced offices are up on the top floor of the building, so if you want a serviced office which can make the most of views such as this, combined with a character-filled building and modern facilities, Arrow Mill really does make for a perfect base for your small business. Add to that an onsite management team to look after you, and with all rental prices including access to our very own dedicated high-speed broadband, all utilities, free parking, reception services and security, what more could you ask for?! So if you are looking to move your new, fledgling business out of your home, or you just need a new base for whatever reason, then look no further. Give us a call on 01706 716000 or check out the office availability page of our website.